If you’ve spent any amount of time traveling and searching for vacation rentals over the last few years, you’re probably familiar with airbnb.com. Airbnb’s website is a marketplace which connects renters or property owners with people searching for a unique place to stay at their destination and a reasonable rate. And since 2008, it has helped over 40 million guests find places to stay in over 34,000 cities! Many Airbnb hosts completely cover their mortgage or rent by using the service and some are able to actually cover costs and make a living. But what does the average renter or homeowner know about building a successful business model and making money by renting out their space with a service like Airbnb? Recognizing the astronomical growth trajectory of Airbnb and how it easily allows users to make money with something they’re already paying for, in step entrepreneurs Jim Breese, Symon He, and Evan Kimbrell. Established Airbnb hosts with backgrounds in real estate and finance, they first began writing and publishing timely blog posts on hosting best practices from their own experience. As Jim and team quickly established learnairbnb.com as the premiere blog on Airbnb hosting, they also saw the potential to provide premium structured training which could help anyone, anywhere begin profiting from their living space. As lead instructor, Evan, mentions in the first video of their course, he lives in a $3,000 a month apartment in San Francisco and has not had to pay his own rent out of pocket in 22 months! So there’s a ton of value in the training they have to offer. Learnairbnb.com was born and the trio created a comprehensive online training website which charges its members a one-time fee for access to an incredible library of videos and resources for people who are hoping to spend as little time as possible making as much as they can leveraging their existing space. And we’re thrilled that they chose WP Courseware to structure and deliver their course! The guys at learnairbnb.com chose to primarily use video lessons for their content, and the videos are expertly crafted. While we can’t disclose the exact contents of the course, learnairbnb.com covers all of the topics associated with renting out your space, from creating an attractive listing to maximizing the guest experience to evaluating your profits and paying your taxes. They’re experts at this and they have done very well capitalizing on teaching something that they already understood and were blogging about online! As many of you know, we’re big fans of video-based training content and it’s one of the reasons we chose to make WP Courseware course units a simple WordPress custom post type…you can include anything which assists in delivering your content in the most effective manner and also use your existing content within a course. 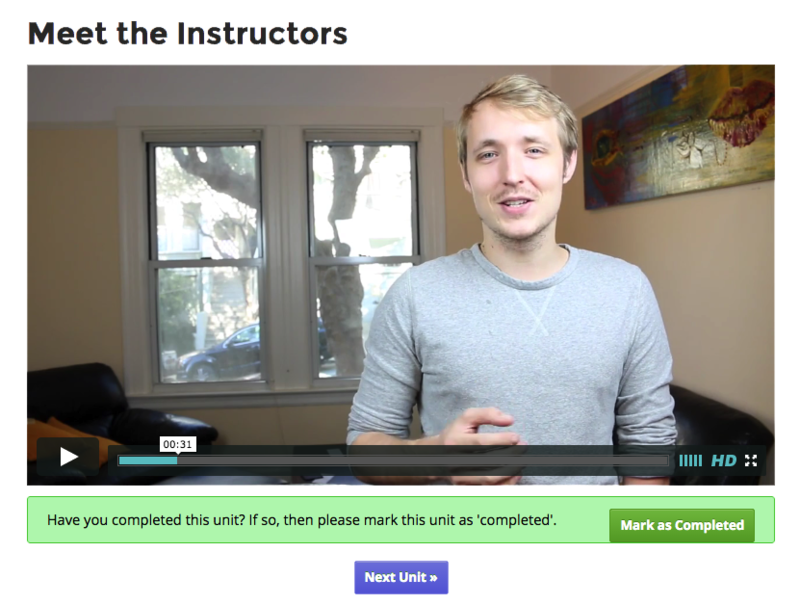 The course at learnairbnb.com includes 67 units spread over seven modules. Currently, the team is offering lifetime access and updates for $329…not bad, even if you learn to cover only one month of your rent or mortgage. The one-time fee training model has become incredibly popular recently, as recurring monthly membership sites tend to lose members after two to three months, on average. It makes a lot more sense to charge a one-time fee of $329 up front instead of losing a customer who is paying $49 per month after two months. 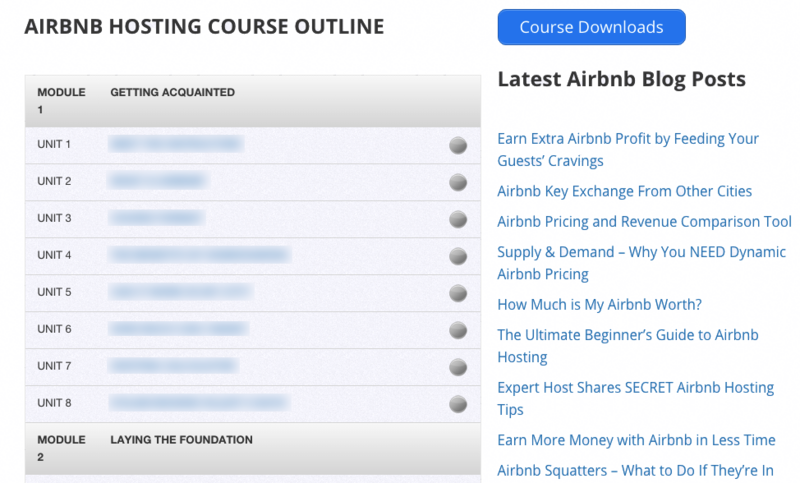 The site currently uses Vimeo to host its videos, and then those videos are embedded into each course unit. Once logged into the training, Evan has put together a slick welcome video which explains a bit about what the content will cover and uses his story to solidify the value that they’ll be providing. As far as WP Courseware implementation, the site uses a standard course outline on the user’s dashboard page. This page allows access to all units of the course, as well as a link to the “Course Downloads” page which features access to presentation slides used in the videos, a spreadsheet calculator for making financial decisions, and “cheat sheets” for the course itself. The final module of the course, the “Extras” section, also utilizes WP Courseware course units to offer a few value added features which include a space for course feedback so the team can continually improve on its existing course offering. Jim was kind enough to answer a few questions for us regarding the history of the site, how they’re marketing the course, its success, and why they chose WP Courseware to deliver their content. Fly Plugins: We know that you, Symon, and Evan all have extensive experience with Airbnb.com, as well as experience in real estate and finance. But how did the three of you meet and what fueled an interest in creating this specific course as a digital product? Jim Breese: Symon and I are business partners in a few other ventures so it was natural for us to create LearnAirbnb together. After about a year of blogging and consulting, we linked up with Evan and created a partnership. Actively seeking out experts in your niche will tremendously help…our partnership with Evan sprang from a cold email. Symon and I created our website and education products because there was a need that no one was fulfilling. It was a niche that’s new and exciting to work on. What really made us go digital is the idea that the Internet is a scalable way to make a bigger impact and help more people. The more people you help, the greater your influence in that market. FP: How are you currently marketing the course and are there any other channels you hope to move into? JB: We market the course through many channels. We have a built-in user base from our blog, so that helps a lot. Our marketing strategy is simple. First and foremost, we organically market through search engines. We spend a lot of time researching keywords and phrases and create high quality content around them. SEO is great because the leads are all free and users find you at their own will. We have also used social media ads with Twitter and Facebook with some degree of success. Lastly, we use remarketing to keep our brand top of mind. Another channel we are considering trying is content amplification for our blog. FP: We noticed you have what seem to be very effective lead magnets for your email opt-ins, including a complex financial calculator for Airbnb hosts to estimate their ROI, as well as a sampling of your course content. Have these strategies been effective? JB: Yes, they have been effective in generating email sign ups. I am a firm believer in delivering a TON of value before asking for something in return. By educating people for free, you are creating trust. You must prove you are an expert in their mind so when the need for paid education arises, they think of you. Also, when you make these lead magnets, they are out there forever…being shared and passed around. It’s free referral marketing, and it works better if those freebies deliver a lot of value. FP: How successful has the course been so far? JB: I don’t share financials, but I will say that the ROI on the course is the BEST of any financial choice we have made for our business…by a long shot. It doesn’t take much to create a course : time, screen-sharing software, and expertise in a topic. For example, maybe it’s a total financial investment of $250 to get your MVP course up and running, and you can easily earn earn that back with just ONE sale. The best part is that you benefit for as long as the topic is relevant…which could be years. FP: Why did you choose WP Courseware? 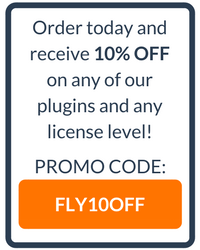 And what other plugins or processes are you using to charge for and deliver your course? JB: I chose WP Courseware because it was proven to work well from 3rd party reviews, seemed easy to use, and had simple integration with Paid Memberships Pro. It seemed like it had all the features that an instructor would need without any hassle…and that it does. I really appreciated that I could track student progress as well as give them a way to track their own progress. We also use OptimizePress for our lead pages and course dashboard pages. Another cool plugin we use is WP First Letter Avatar. It helps make your course comments/questions look more interesting by giving every student a unique letter avatar instead of just the simple grey head image. We chose to use learnairbnb.com as a case study for a good reason. It’s a great example of how you can turn your existing knowledge of whatever it may be into a paid digital product, like an online course, to create a passive online revenue stream. Perhaps there’s something you’re already knowledgable in that you haven’t even considered offering to the world.